Having a full-time job can often prove to be a daunting task for many individuals who have a lot on their plate, in such a case people often opt for part times jobs. Guest lecturers in a college. SHOULD STUDENTS WORK PART-TIME WHILE STUDYING? You might be very well aware of the expenses that higher education costs nowadays. So students taking up a part-time job is very common. Especially when pursuing studies in the foreign land. Furthermore, for few students, part-time jobs are very helpful, be it for paying tuition fee, academic fees, or for any extra allowance. Though working part time along with studying has many disadvantages, you also have a set of advantages too which we have discussed in this article. Enlisted, here are few top 10 reasons to take up a part-time job. 4. You can answer the question when asked “What do you do? 5. Can try different career sectors. When you are a student, taking up a part-time job is fine but you need to be able to handle both of them effectively. When talking about part time job while studying, the first thing that comes to our mind is pay (money) but the one con that hits our brain is, can we balance both work and study? You need to be very clear in your mind about it. Here are a few tips that help you maintain a balance between your job and study. Part times jobs are the best option for students as it gives them an opportunity to earn a little pocket money with which they can pay some of their bills as well as it gives them enough time to focus on their academic work. Having a full time job and simultaneously attempting to juggle academic work is a near impossible task for any student. Having a part-time job works out very well as it gives students a chance to gain some work experience and also gives them something to include in their resume. Once they have graduated from college with some work experience it gives them an edge over the freshers as they already know how to conduct themselves in a professional manner and they have also gained some organizational skills. Most colleges make it compulsory for students in their final year to opt for a part time job or even an internship so that they can broaden their horizons. Getting work experience is one of the best advantages of part time workers. Due to unavoidable circumstances, there are a number of capable and bright individuals who cannot take up full-time jobs; these people mostly include those mothers or even fathers who have very small children. Part-time jobs give such individuals the opportunity to work as per their own convenience when their child is either at school or at one of his extracurricular classes. Besides the obvious advantage that these people get to earn some money for themselves and their families, they also receive some job satisfaction, where they assure themselves that they are finally taking out some time to follow their own passions and build their own career. Part time jobs work out great for elderly or even retired individuals who are physically and mentally unable to work around the clock. Having a part-time job gives them a good opportunity to get dressed, get out of the house and exercise their brain cells so that they keep themselves alert. Having such a job gives them purpose without which they often become disillusioned and self involved. The biggest advantage of having a part time job is the fact that there is less pressure involved. For those individuals who have anger management issues or are prone to high blood pressure having a part-time job really helps them to relax. This does not imply that having a part-time job means that you have absolutely no work pressure, it simply implies that since you work for fewer hours, therefore, you are not stressed out throughout the day. Opting for a part-time job is very advantageous as you can choose your work hours as per your own convenience. And nowadays you can find a part-time job very easily according to your convenience. If you are a student and have classes throughout the day, then you can choose to work during the afternoon or even the night. Otherwise, if you are a mother or a father with a young child then you can work in the morning while he or she is at school or if you are an elderly person then you can decide for yourself whether you would like to work in the morning, afternoon or evening. Having a full-time job does not give one the opportunity to choose his or her work hours. Having fewer work hours implies that you can focus on other important areas of your life which you would otherwise not be able to pay attention to if you had a full time. People with full-time jobs often miss out on important family or social events as their work pressure doesn’t permit them to attend these occasions. So to get the best of both worlds people take up part-time jobs so that they do not miss out on any important days in their loved ones lives. Having a part-time job often implies no job security and in case of an economic crisis, it is most likely that the company is going to let the part-time workers go. It is rather unfortunate as just because people work part time that does not imply that they put in less effort. It is a common misconception that those who work part-time in a company do not take their jobs very seriously and therefore if they are fired it would not make much of a difference to them. This is, in fact, one of the chief disadvantages of working part-time. The importance of health and safety at workplace is very important and employers are very keen to make sure that nothing unfortunate happens to their employees. But there are also many companies who prefer hiring part time workers as this implies that they do not have to provide those employees with health insurance. In this day and age where medical treatment costs so much, not having any sort of medical insurance is a huge risk. In case of any medical emergency if you are forced to spend from your own pocket it could cost you a bomb. This is one of the main reasons why having a full-time job could be a better option if you are the sole breadwinner in your family. Full-time workers in most companies get health insurance for themselves as well as their family members who are dependent on them. Another big disadvantage of having a part-time job is that most often part-time jobs offer no retirement benefits. No matter how many years while working part time you have given your dedicated service, it is unlikely that you will receive any retirement benefits. In order to enjoy a happy retired life it is important to make sure that you have some money saved so that in your old age you do not have financial troubles. It is incredibly heart wrenching to see old people working tirelessly to earn a little money in order to make ends meet. Full-time jobs are beneficial in the manner in which they offer a number of retirement benefits which ensure that they continue to have a high standard of living even when you are old and unable to work. It is extremely rare that companies choose to grant promotion to an individual who works part time. In an office, to climb the corporate ladder it is necessary to be at the helm of things and constantly in an office or in contact with the office so that you can display your expertise when it comes to acting in an emergency. Part-time workers are not at the office all day long so no matter how good they are at their job they may not get a chance to display their talents or skills when necessary. Though there maybe less pressure involved in having a part time job, yet having to juggle various aspects of your life might prove to be a great challenge for some. Having to study and simultaneously work or having to take care of a child along with working part-time could easily take a toll on one. Multi tasking is not as easy as it may sound and according to t some sources are bad for health. Having a part time job as well as attempting to manage other things could indeed be tiring. Attempting to concentrate on too many things at one time is not always a positive thing as it could make you ‘Jack of all trades but master of none’. 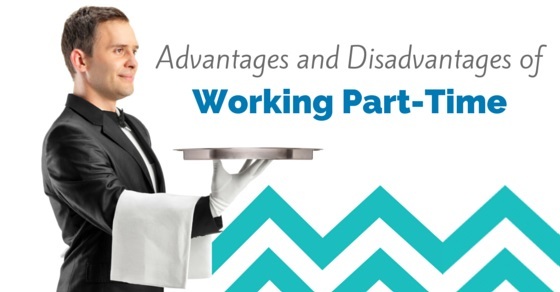 Working part-time has its fair share of advantages as well as disadvantages. Every story has two sides, so if you do choose to opt for working part time you should carefully evaluate each advantage as well as disadvantage. Since each individual has his or her own set of priorities therefore it is up to him or her to decide upon whether to take up a full time or part-time job. Just remember that no matter what you choose you should be happy and love what you do.